Leeds is a very large station with twelve platforms, but is all modernised and concrete, and is very busy with many commuter lines coming into the city. The train leaves a few minutes late at 08.35 and is pretty empty, though many commuters got off it as it came into the station. We leave from platform 3B and go west passing junctions to Castleford, Wakefield and Huddersfield, before going along the line to Skipton as far as Apperley Junction, reaching 50 mph. We then leave the Skipton line and turn right and go north westwards onto a single track as far as Springs Junction, where it becomes double again. We enter a cutting and then the track doubles again then as we enter a short tunnel, then another cutting before emerging with fields on both sides. We are joined by line from Shipley and then go into another cutting and then tunnel, before we slow for Guisley station. It's been rebuilt in recent years with a large waiting room on the right and an even bigger station building on the left. The platforms are quite long and are overgrown at the ends. There are houses on the left and old industrial buildings on the right, then countryside again. We go through a cutting, then slow for Menston. A cricket pitch can be seen on the right, whilst a car park is on left, just before the station. The original yellow brick building is on left and a smaller waiting room is on the right platform. It has been modernised in recent years, but looks in nice condition. We then go into a low cutting before emerging to a view of the hills on the right and then on the left are cows in fields as we go downhill slightly here and then stop for Burley-in-Wharfedale. It has two largish red and cream glass shelters and a footbridge, which has been rebuilt in recent years. The platforms have been shortened though. We then go onto an embankment, with sheep grazing up on the hill to the left of us and cows in the fields to the right. We speed up to about 50 mph with the A65 running below us on the right. We then come into Ben Rhydding station, which like Burley-in-Wharfedale, has two red and cream shelters and the original footbridge, which is also painted in these colours. There are houses on both sides as we leave the hill on left and soon we change over tracks as we don't go much further before coming into Ilkley station. It has just two platforms now, though was much bigger as evidenced by the station buildings. There is a large car park on the right, and straight ahead there is a Marks and Spencers, built into the original yellow stone station building. 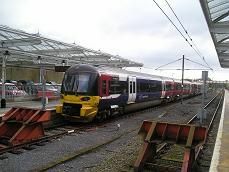 Trains leave for both Leeds and Bradford at half hourly intervals.